The emergency call came the night before. Mom's refrigerator was out. So we drove over there with the bright idea of moving her frozen food to the freezer in the basement. Unto Dust. An iPhone 6 Plus capture at f2.2, 1/4 second and ISO 80. After a good cleaning with the Camera Raw filter in Photoshop CC. But when we got there, we found things were worse than we'd imagined. The mustard-colored appliance didn't just die, it kept pumping but it was pumping hot air into both compartments. So the food had spoiled. And, naturally, there was some medication in there that required refrigeration. We did transfer a few things but we went home, did a little mostly fruitless research and returned the next day. Our first task when trouble shooting is to clean. So that's what we did. We rolled the old box out from its bay, took the back panel off and saw what you see above. 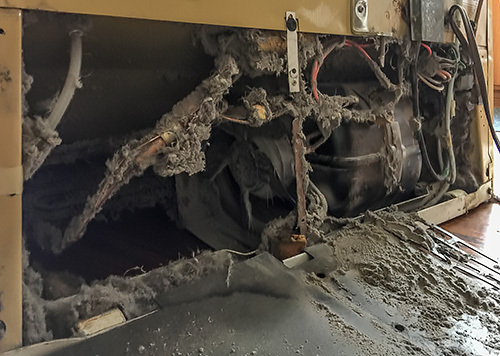 We reduced the accumulated dust from 40 years to just under 10. No one alive remembers when the Harvest Gold refrigerator was installed. It could have been in the early 1980s. A Brief History of Kitchen Appliance Color Choices suggests that was near the end of that color's run. Which would make it 35 to 40 years old. So you're looking at an archeological dig here. And we did find things. A small photo of our grown niece as a child. A chocolate bar. A pat of butter. Carbon dating wasn't in the budget. We vacuumed, we brushed the coils, we vacuumed, we shot some compressed air in there, we vacuumed. We reduced the accumulated dust from 40 years to just under 10. Parts were again visible. We put it back together, plugged it in and pushed it back into its bay. We were too tired to open the doors but we heard it come on and run more quietly than usual. After we cleaned up and put everything away, we did open the doors. Hot air. Oh well. We started making calls to repair places when an hour of online searching didn't reveal a current model at Costco, Lowes, Home Depot, Best Buy or Amazon that fit the bay. Everything is bigger these days. Then we asked Mom if she was hungry. She had no food in the house now so we thought we'd run to get her something for dinner. "I have soup," she said. A trouper.